It feels so good to be home and reconnecting with my clients. So many of us are traveling and getting out of our comfort zone and experiencing anxiety about what to eat on the road. I have to admit, I was a little nervous about traveling to Peru recently and eating vegetarian for an extended period of time at a retreat center. Especially knowing we were going to be climbing mountains and hiking ruins! I was fearful of how I would have enough energy, and where would I get my protein from? As you can see in the picture here, I loaded up on some simple and lightweight foods that would pack a punch while I was traveling and burning a bunch of energy. Grass fed beef jerky is one of my favorite and easy to pack protein sources for when I am traveling and need some clean protein. Nitrate free salami is also great for while you are traveling because it isn’t likely (not yet) that you will find local hormone free meat at the airport. 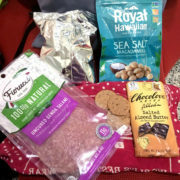 My favorite airport meal I like to throw together for my travel day is to bring some Simple Mills GF crackers from home and salami and grab a salad (which is often organic) at the airport. I always get my dressing on the side so I can decide how much once I read what is in it, and if it is a sit down restaurant I just ask them to bring me some olive oil with sea salt and a lemon. Ta-Da! Although the ingredients are clean, it is still processed and a whole food snack like an apple with almond butter or carrots and pea dip would be far more nutritious for you. In planning for my trip, I suspected I would have an “oops” moment when I would know that I accidently had something that was not going to land well in my digestive system. One of my go-to’s for travel is activated charcoal because of its incredible ability to bind and capture all toxins in the body. It’s perfect for food poisoning, stomach bug, accidental gluten encounter, post alcohol, and for everyday detoxification. Charcoal has been used for years traditionally in many cultures and in hospitals for patients that have overdosed on drugs. It is SO incredibly useful while traveling in case you accidentally had gluten in a salad dressing and realize it immediately, or in the event you accidently had two margaritas. Ok that is not likely an accident, but this is a great tool to clean that up in your body. Charcoal can help remove the toxins in alcohol when you have enjoyed one too many beverages this summer and also can bind to gluten and casein for those of you with sensitivities. I get the questions often of how often can I take charcoal? You can take it as needed, and some functional medicine doctors even approve of it for daily use to help in detoxification. I also get asked the question; will it also absorb nutrients, medications, and supplements? The answer is YES! It will remove any supplements, medications, vitamins, or minerals that are in the body as well. Dr. Amy Myers recommends taking your supplements an hour before taking charcoal, including probiotics. I try to minimize the number of supplements I take each day. I think the body becomes reliant on them to help it do what it innately knows how to do so my focus is on making sure that everything is highly functioning without supplementation. Juice Plus+ is simply food and the only product I take each day for my back up plan. It bridges the gap between what I am “supposed to eat everyday” and what I do eat. Although I eat super clean, having the variety of 30 fruits, veggies and berries in my diet everyday is unbeatable and is rebuilding my immune system inside and out everyday. However that being said, charcoal is great as needed, for the “oops” or post happy hour cleanup, but is also recommended by Dr. Amy Myers for daily use to help assist with detoxification. She recommends 2 capsules in the morning on an empty stomach, and building up to 2 more in the evening on an empty stomach. The real bonus is that if you are struggling with mold issues, heavy metals, and die off from candida or SIBO symptoms, activated charcoal can bind to these toxins and safely remove them from the body. You can learn more here and watch her short video to learn how the process works in your body. What other challenges do you have when it comes to travel? I would love to support you. Just email me here and fire away!